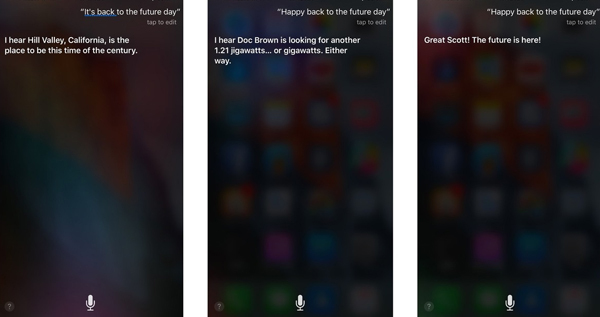 Today is 21 October 2015 by other known name “Back to Future Day” if you have been reading the coming day in news you are probably fully aware of the day and what Siri has a surprize to all users. Siri has been prepared to give you responses you expect from such a day and I have tried some along the day and it made me smile, amazingly clever responses relativeness to the question asked is also remarkable. A digital personal assistant ready always to give you sarcastic remarks of the day you have been waiting for a long time. In the actual movie when Marty McFly travels to 21/10/2015 we were watching the changes they have been facing with flying hoverboards and colourful hair and clothes, very developed technological gadgets, self-tying shoes and many other small things that does not exist in our 2015 yet, but those days watching this movie was enough to imagine the coming years, companies still trying to produce the flying hoverboards and it has been a phenomenon of the 20th century that we expected flying cars, hoverboards and no traffic issues, imaginary but nice. If you are a fan of Back to Future as I am and tried some conversations with SIRI today we would be very interested to know if you can share them with us.